Years ago Dean Martin sang the song, "Baby, It's Cold Outside" and in the days following Thanksgiving that tune kept running through my head as the temperature kept dropping and the wind chill kept increasing. Yes, we were in the storm warning area but no, the island didn't receive all that predicted snow. 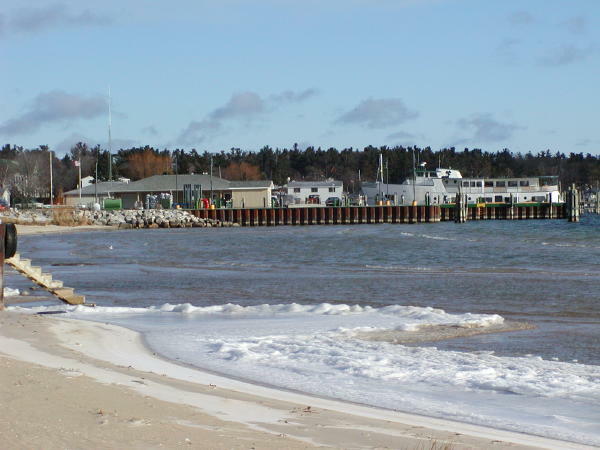 It's entirely possible that the north wind simply blew all the white stuff across Lake Michigan to the tip of the mitt since that's where there was some accumulation. Needless to say, the island has been a tad bit chilly the past few days. We may be above sea level but we were below zero with the wind chill. When asked about the little bumps on my arms I stated that "those are NOT mosquito bites, they're goosebumps!". This summer there was a bumper sticker being sold that stated, "Slow Down ...This Ain't The Mainland". For the months of December through March we need one that says, "Honk If You Can Still Feel Your Fingers". We've managed to go from almost 100o to zero in 4.5 months! Year 'round islanders aren't just nice, we're numb. I braved the elements for a very short time this morning to find a sampling of the beginning of the Island Ice Age for the 2002/03 season. I had to stop when my fingers couldn't feel the shutter button any longer. I've come to the conclusion that winter is a test of character and those who fail it move south and leave the rest of us characters here to enjoy paradise with a wind-chill factor. Dan Gentle is a quiet man who expresses himself without words through fabulous works hand-crafted in wood. Originally from Bay City, he came to the island a little over fifteen years ago and like many others before and after him, got the sand of the island in his shoes and became a permanent resident. Gentle built the fabulous staircase in a Fox Lake home two years ago and has been making furniture that is for sale at the Emerald Isle Art Gallery. He produces tables of maple, birch, ash and burls. An artist and perfectionist, it may take up to two years to complete a table to his satisfaction. Everything is custom made and is a work of art in itself. His most recent work is the steeple that stands proudly atop the St. James Episcopal Mission. Like the staircase, it's crafted in island cedar. Dan is ecumenical in his church woodwork, having also constructed the large wooden cross at the Holy Cross Catholic Cemetery. Here's a peek at some of the wonderful pieces he's made. If you're interested in contacting Dan Gentle about his work or having him make you a custom item, call him at 231-448-2340. An exacting craftsman, Dan's work will certainly become an heirloom piece for generations to enjoy. Each and every piece is as unique as the artist who built it. Saturday Post Office hours on the island are always fun to try and anticipate. Just as soon as you're positive that it's open from 12 to 3, you arrive to discover that it's now 10 until 2 or one if by land and two if by sea. Once winter arrives the mail stops arriving via the ferry and is flown in by Island Airways... which means we don't have to wait until afternoon to see if we won the Publisher's Clearing House Sweepstakes. Doing a little hunting around I came across this snippet from the Charlevoix Sentinel about the Island mail service. It's dated February 11, 1882 and I thought you might enjoy reading it also. 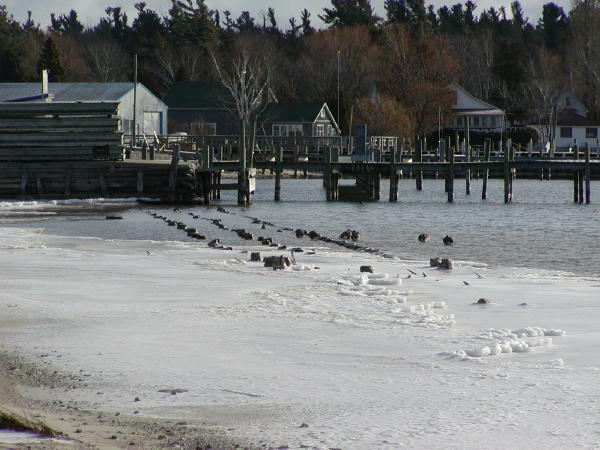 "Very little thought is taken of the perils that attend the transportation of the mails from the main land to Beaver Island during the winter. Of course no schedule of time can be observed, but trips are made by water and on ice whenever an opportunity is offered. Dangers are encountered with nothing but brave men would face - terrible winter storms, the drifting of the ice, the blinding snowstorms, and in the spring the breaking up of ice, which hazards the lives of the plucky foot travelers. C. Moore and C. Gallagher of St. James, are performing the service this winter. On Friday, the 20th, they arrived at Harbor Springs with the mail, and started out with the return pouch in an open small boat for the Island. During Friday night and Saturday a fierce storm accompanied by a gale made Lake Michigan a scene to strike terror to the bravest. Yet the brave mail messengers were out in it. 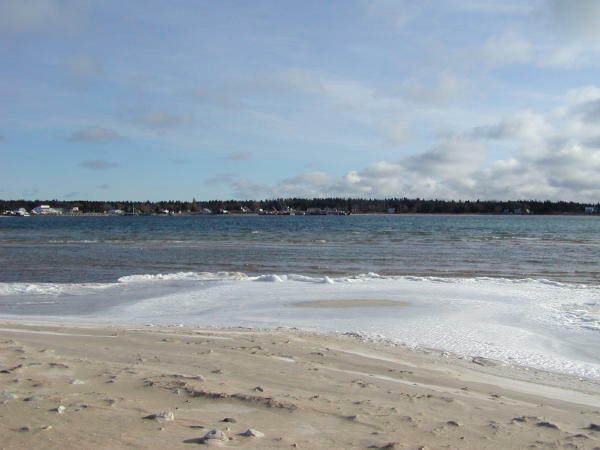 The people at Harbor Springs expected to hear of their loss, and telegrams were sent along this shore, to watch for them as the wind was northwest. Word came from their own mouths, for they reached their destination safely, and on Tuesday arrived back at this port, where they remained over night and proceeded to Harbor Springs, exchanging their mail and arriving back here Thursday, where they were weather bound until Friday morning, when they left for the island, with a fair wind and moderate weather. Mr. Gallagher, the contractor gets $950 per annum for the service, but considering the perils of life and health, he earns twice that amount." Mark Thursday, December 5 on your calendar for 6 - 8 p.m., at Nina's Restaurant. 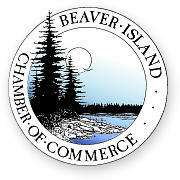 The Business After Season, Holiday Celebration will feature cocktails and hor d'oeuvres, a 50-50 raffle and a presentation by Jeff and Bill Cashman about the internet and how easy it is to use the Chamber of Commerce web site to your advantage. For those interested in the full meal deal, Nina's will offer dinner from their winter menu. To cover the cost of Nina's great hor d'oeuvres selection, a $5.00 cover charge will be collected at the door. Everyone is welcome to attend the event, you don't have to be a member. Don't miss the fun and the opportunity to learn more about your Chamber of Commerce. Bring a friend! On November 10, 2002, at about 1816 central standard time, a Cessna 175, N7091M, dropped out of radar coverage over Lake Michigan south of Fairport, Michigan. Both the US Coast Guard and the Civil Air Patrol conducted a search for the airplane and its occupants to no avail. The pilot and passenger on board are presumed to have been fatally injured. The airplane is presumed to have been substantially damaged. The Title 14 CFR Part 91 personal flight was operating in marginal visual flight rules weather conditions and a flight plan was not filed. The airplane last departed Fond Du Lac, Wisconsin, around 1645, en route to Beaver Island, Michigan. Both the US Coast Guard and the Civil Air Patrol have terminated their searches as most know. Thinking ahead though, come summertime it's hoped that folks hiking in the woods and beachcombing on the island, on the outer islands, in Wisconsin or the Upper Peninsula, will keep their eyes open for anything out of the ordinary that might relate to the loss of this plane and give closure to the family.